style, for those who want to indulge in luxus with style. The central location allows guests to experience the city at 360 degrees. 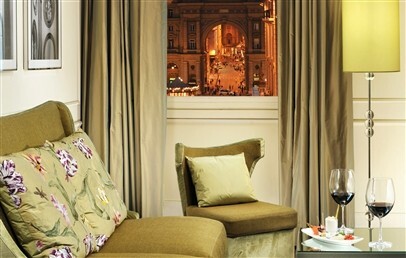 Suitable for romantic holidays, for couples of all ages or short getaways to experience the true life of Florence. 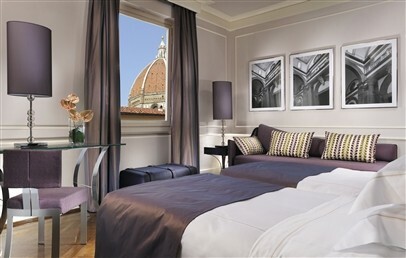 Brunelleschi Hotel enjoys one of the most spectacular and ideal location for spending an holiday in Florence. Situated in the historic centre of the city, it is 50 m far away from the Duomo and within walking distance from the Uffizi, the Palazzo Vecchio and Piazza della Signoria. The most interesting places of Florence can be reached strolling around the control traffic zone or, if you prefer, to rent a bicycle, that the Hotel Brunelleschi offers to its guests. The Amerigo Vespucci, the main airport of Florence, distance 7.4 km from the hotel while the train station 700 m.
The historical building that hosts the Hotel Brunelleschi was successfully restructured from a circular Byzantine tower and from a Medieval church. Its fascinating past is increased by ancient furniture and by a museum that exhibits the architectural ruins discovered during the restoration of the hotel. It has of 96 rooms and suites, two restaurants, an American bar and two conference rooms. A good story about the Hotel is its mention in “The Da Vinci Code” by Dan Brown. 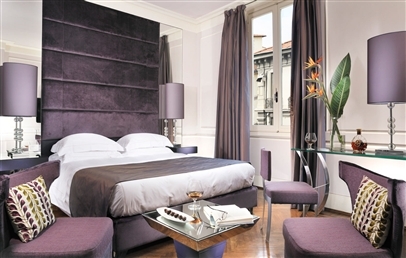 The rooms and suites at Hotel Brunelleschi are elegant, luxury and with romantic views. The Classic Executive rooms (18 sq.m.) have been renovated by the architect Benelli in a contemporary style with all the accessories designed exclusively. Can be double or twin with walk-in closet and large bathroom. The rooms face Via dei Calzaiuoli or the picturesque alley del Giglio. The Superior Executive rooms (21 sq.m.) furnished with a unique and refined style, have a four-poster bed, a large bathroom and face the inner Piazzetta del Giglio or Via dei Calzaiuoli. The Deluxe rooms (26 sq.m.) have been renovated by the architect Benelli in a contemporary style with all the accessories exclusively designed; some rooms have panoramic view of Florence (on request). They consist of a double bedroom or twin with walk-in closet and a marble bathroom. The Junior Suite Executive (40 sq.m.) 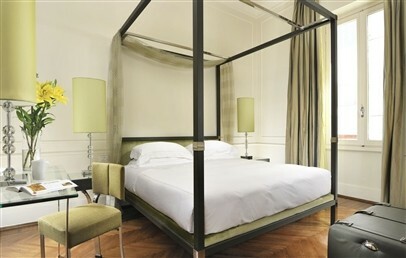 furnished with a unique and refined style, provide four-poster bed and oak parquet floor. They consist also of a large bathroom and face the street Calzaiuoli or Piazzetta del Giglio. The One Bedroom Suites (from 45 sq.m.) have been renovated by the architect Benelli in a contemporary style with all the accessories exclusively designed. They overlook Via del Corso or the inner Piazzetta del Giglio. They consist of a double bedroom with walk-in closet and a marble bathroom. A fitness room is available from 6 a.m till 9 p.m. Fully equipped with Technogym equipment, presents parquet floors, mirror walls, fitting room, lockers and showers. For little guests and their parents, the Brunelleschi Hotel furnishes kettle, cradle, highchair, bottle warmer, napkins and wipes. On request and upon payment, it is also available a babysitting service. Renowned throughout Florence, the Santa Elisabetta Restaurant and the Osteria della Pagliazza represent the best culinary choose to complete your stay at the Hotel Brunelleschi. The restaurant offers delicious national dishes skilfully prepared by the stared chef Rocco De Santis with usually add a pinch of creativity. The restaurant Santa Elisabetta, reopened recently with new menus of the stared chef. It is located in the ancient Byzantine tower Pagliazza, offering an intimate and elegant setting for candle light dinners, food and wine tastings, business lunches and weddings. On the ground floor of the tower is instead the Osteria, where enjoy the most typical Tuscan delicacies. The rich national and international buffet breakfast is served at the Liberty Saloon and at the Sala del Pozzo. The lounge Tower Bar is perfect for an aperitivo with friends. Wi-Fi is complimentary and available throughout the property. The staff and concierge service are available around the clock while, only during the summer season you can enjoy the outdoor pool at the sports center CT Florence, one of the oldest in Italy and located at a short distance from in the Hotel in the Cascine Park. Several additional facilities are at your disposal for any kind of need: car park in a private garage, 24 hour in-room service, laundry and dry-cleaning service, rooms with easy access for disabled people, dogsitting service, meeting rooms and personal shopper. Small size animals are welcome in the hotel rooms but are not allowed in the restaurants and in the common areas. Precious and elegant Suite, renovated by the architect Benelli in a contemporary style with all the accessories exclusively designed and parquet floor. The intimate and comfortable bedroom is equipped with walk-in closet, Privilege Beautyrest Simmons mattress, luxury bed linen by Pedersoli, two feather type and two hypoallergenic type of pillows. The marble bathroom has hydro massage bathtub, hairdryer, make-up mirror, fluffy terry towels, slippers and bathrobes and a Dr. Vranjes complimentary toiletries. The Suites overlook Via del Corso or the inner Piazzetta del Giglio. Twin bedroom with two 200x95 cm beds which can be joined into a comfortable kingsize double bed (on request). The remaining offer a king-size bed 200x190 cm. All are elegant furnished in a contemporary style with all the accessories exclusively designed. The Deluxe rooms provide also parquet floor, walk-in closet, Privilege Beautyrest Simmons mattress, two feather type and two hypoallergenic type of pillows. The large bathroom has shower or bathtub, hairdryer, make-up mirror and a Dr. Vranjes complimentary toiletries. 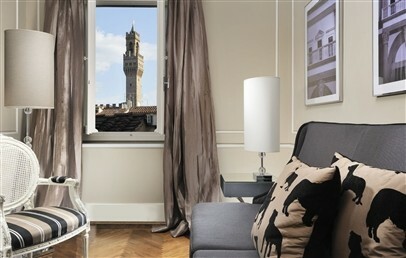 The Deluxe rooms have a view onto Via dei Calzaiuoli, the heart of Florence shopping district or face the litttle Giglio Square (view on request). Double or twin bedroom elegant renovated by the architect Benelli in a contemporary style with all the accessories exclusively designed and parquet floor. The welcoming bedroom provides walk-in closet, Privilege Beautyrest Simmons mattress, two feather type and two hypoallergenic type of pillows. The large bathroom has shower, hairdryer, make-up mirror and a Dr. Vranjes complimentary toiletries. The Classic Executive rooms face Via dei Calzaiuoli or the picturesque alley del Giglio. Bright, intimate and elegant furnished double room. It is equipped with oak parquet floor, walk-in closet, four poster bed with Privilege Beautyrest Simmons mattress and two feather type and two hypoallergenic type of pillows. The large bathroom has shower or bathtub, hairdryer, make-up mirror, fluffy terry towels, slippers and bathrobes and a Dr. Vranjes complimentary toiletries. 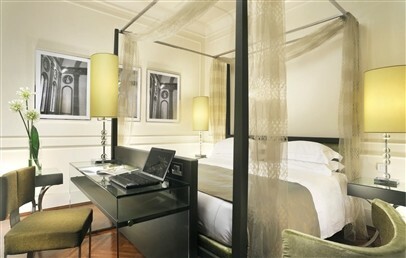 The Superior Executive rooms face the inner Giglio square or Via dei Calzaiuoli. Bright, intimate and elegant furnished double room. It is equipped with oak parquet floor, walk-in closet, four poster bed with Privilege Beautyrest Simmons mattress and two feather type and two hypoallergenic type of pillows. The large bathroom has shower or bathtub, hairdryer, make-up mirror, fluffy terry towels, slippers and bathrobes and a Dr. Vranjes complimentary toiletries. The Junior Suites face Via dei Calzaiuoli or Piazzetta del Giglio. Twin bedroom with two 200x95 cm beds which can be joined into a comfortable kingsize double bed (on request). The remaining offer a king-size bed 200x190 cm. All are elegant furnished in a contemporary style with all the accessories exclusively designed. The Deluxe rooms provide also parquet floor, walk-in closet, Privilege Beautyrest Simmons mattress, two feather type and two hypoallergenic type of pillows. The large bathroom has shower or bathtub, hairdryer, make-up mirror and a Dr. Vranjes complimentary toiletries. 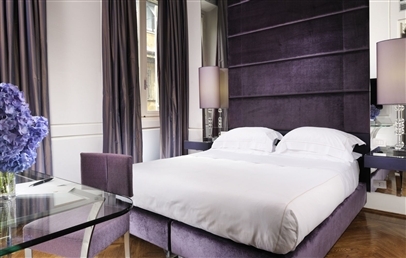 The Deluxe rooms have a view onto Via dei Calzaiuoli, the heart of Florence shopping district or face the little Giglio Square (view on request).